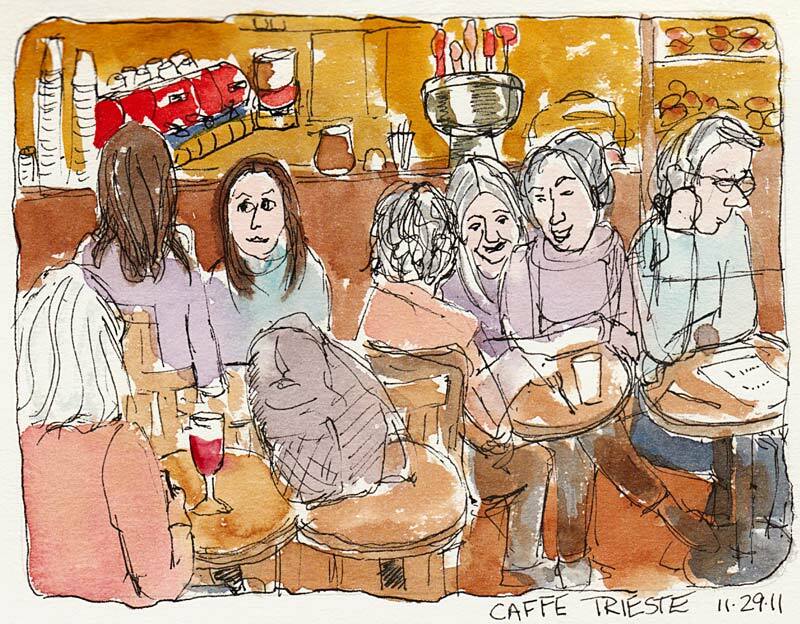 Caffe Trieste (she's saving seats with her backpack) before the band (then six people crowded around those 2 tiny tables, sitting on laps), ink & watercolor, 7x5"
In an interview, Robert Genn was asked, “How does an artist find their own style?” His answer was brilliant. He said (paraphrased here) that typically what makes your style yours, what makes it unique, is the thing you do “wrong;” it is the way you break the rules intentionally or just don’t do something “correctly” that defines your style. You don’t have to be perfect to be wonderful and neither does your art. 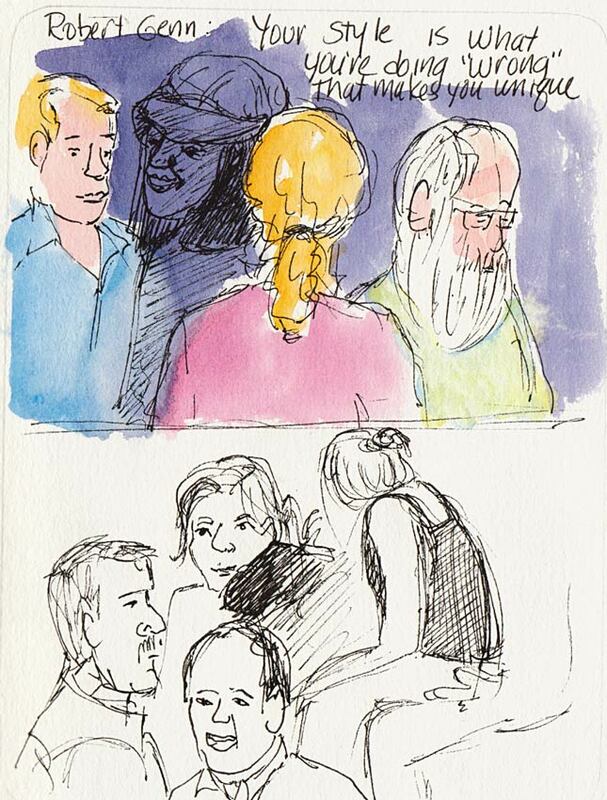 As a matter of fact, “perfect” art (in my opinion) is boring art. When you make mistakes, think about how you’ll do it differently next time, but also look for the bit that worked even if it’s just a small passage. 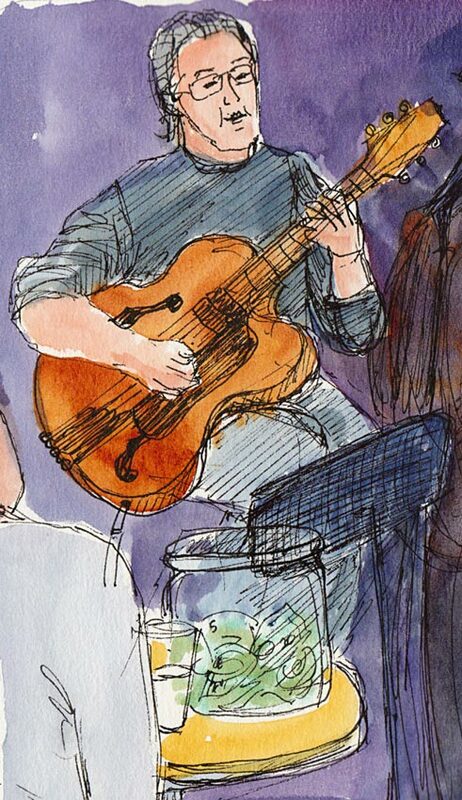 For example in the sketch above, the music stand didn’t work at all, nor did the singer I cropped off on the right, but I did a much better job with the guitar this time than I did last time I sketched at Trieste. But Jana, what if “perfect” is one’s style?? And isn’t Robert Genn just brilliant? He is so succinct, pithy and poetic, practical, and just interesting! You write that you are talking to yourself when you say “appreciate what you can do now and cherish those quirks” but you certainly are talking to the rest of us, too. Thanks for this great post. I’ll go back and embrace some of my wonky lines. And keep on learning more and practicing more, too. Love your blog and look forward to following you! I agree with Katherine, thanks for the encouragement! What sound and happy advice! We can just do what we do, learning, thinking and finding our own personalities in art — works for me!